DIGITALIZATION AND 3D DIGITAL VISION OF THE INDUSTRY THROUGH ADVANCED UNMANNED SYSTEMAS WITH PHOTOGRAMMETRY AND LASER SCAN WITH APPLICATIONS OF AUGMENTED AND VIRTUAL REALITY FOR THE OPTIMIZATION AND FLEXIBILITY OF INDUSTRIAL PROCESS. Dogram, in collaboration with Azisa Drone Company, will carry out during 2018 the development and the implement of advanced technologies in order to optimize and downsize industrial processes, principally of maintenance and production through the digitalization of complex industry installations, with difficulties in accessing and high-sized using unmanned systems. During 2017 and the beginning of 2018 Dogram, in collaboration with the Technologic Centre CTIC will develop a tool for creating and disseminating digital contents, moving closer culture to a more and more mixed up in new technologies public, through a creation of a digital solution that allows to see the cultural contents through the application of digitalization techniques of heritage and virtual reality. That solution pretends to take advantage from the advantages offered by technologies like Virtual Reality and digitalization of contents, in order to provide to the users an immersive experience where they can take part and learn at the same time. The project is supported by aids for the modernization and innovation of creative and cultural industries through digital and technological projects. During 2015 and 2016 we were supported by the Instituto de Desarrollo Económico del Principado de Asturias and the European Union through the program FEDER, thanks to an aid director to companies with a technological base in the Principado of Asturias, for the tax year 2015 in the 2nd phase of consolidation and commercial development. The project has a budget of €92.170,99 with a percentage of aid of 54,40%. At the same time as the development of the I+D project “Advanced techniques for the digitalization of cultural property”, raises the need of creating a lighting and multispectral capture lighting to do spectrographic tests that will allow the detection and discrimination of pigments of different compositions, efflorescence whose nature our condition of conservation make more difficult to distinguish, or even invisible to the naked eye. Developing this system we will be able to complete even more our methodology of technique documentation, the multispectral photography allows to increase the number of broad bands in relation to the three used in the conventional digital photography. It also allows the extension and the spectral range outside the visible spectre, with wavelengths in the infrared and ultraviolet range. This technique becomes more relevant to determine proof readings, renovations, concealments done on the wall paints over the years. With the passing of time, the action of the weather agents and the lighting can also produce chemical reactions, causing alterations in the composition. Obtaining images with a spectral answer, known and calibrated in different instants of time will also allow monitoring the evolution of the conditions of conservation and its temporal evolution. Dogram will invest a total amount of €10.000 on the project “Development of a system of capture and multispectral lighting” granted on a 75% by the program “Cheque de innovación tecnológica para el ejercicio 2014” ‘Cheque of technologic innovation for the tax year 2014‘ through the Instituto de Desarrollo Económico del Principado de Asturias y la Unión Europea through the program FEDER. Dogram starts a new innovation project directed to the introduction and technical consolidation of a series of services for the metrologic control of mining operations. They will be based on photogrammetric techniques, high photography and image processing. The project is granted by the program Innovadores -Innova del Instituto de Desarrollo Económico del Principado de Asturias. Analyses of the results of the production: this makes possible the control of the volume in stockpiles, tailing and cuts. Geometric control of mining rafts. Planning renovation and environmental restoration. Documentation of the current state for planning new project as closed projects for their re-exploitation. 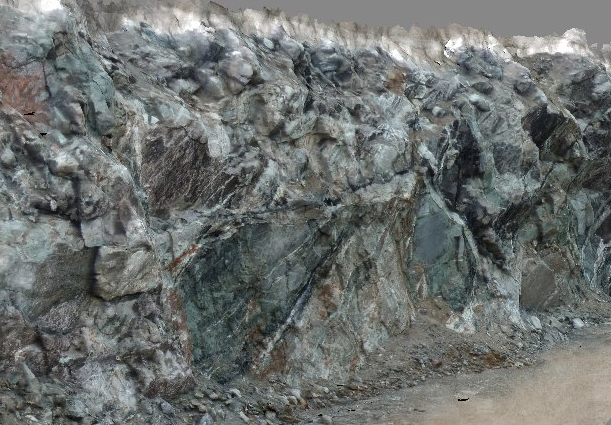 In addition, we will add methods of image processes, necessary to make particle size analyses in situ for the optimization of the blasting planning. Dogram will invest a total amount of €124.358,52 in the development of the I+D project: Advanced techniques for the three-dimensional documentation of cultural property, granted in an 80% by aids to companies with technological basis in the Principado of Asturias. Our pilot bases generated interest and acceptance for the new possibilities offered for the three-dimensional documentation of the cultural property. Due to the improvement of skills in preference to other methods as the typography, NEOs digital photogrammetry, laser scan / structured light, we obtained the support of the Instituto de Desarrollo Económico del Principado de Asturias and the European Union through the program FEDER. Dogram will develop during 2014 an I+D project for the development of this new comprehensive methodology of digitalization, destined to capture the form and the superficial appearance of the objects, independent of their size, with a resolution and a realism unprecedented. In addition, we will develop the necessary techniques for the appropriate visualization and diffusion of these contents. allow the interactive digital diffusion of the contents in popular installations or through Internet, showing virtual replica that react to the light in a realistic way. In the project are also contemplated the necessary developments for the creation of physical replicas, through mechanized and three-dimensional additive printing techniques, from digital models with high resolution, in a range of 4 to 20 micron. Are also proposed advances like silvery through projection of light (temporary or dynamic) or the painting and the automatic application of coating and pigments with a (permanent) robotic arm. Iturbe, A., Cachero, R., Cañal, D., & Martos, A. (2018). Digitalización de cuevas con arte paleolítico parietal de Bizkaia. Análisis científico y divulgación mediante nuevas técnicas de visualización. Virtual Archaeology Review, 9(18), 57. Cachero, R., & Abello, C. (2015). Stereo-photometric techniques for scanning micrometer scale. Virtual Archaeology Review, 6(13), 72. Martos, A., & Cachero, R. (n.d.). Acquisition and reproduction of surface appearance in arquitectural orthoimages. Pérez, A., Cachero, R., Navarro, S., Jordá, F., López, D., Lerma, J. L., & Martos, A. (n.d.). Digital reconstruction of the church of San Ildefonso in Zamora (Spain) using orthoware.